Adventure Game Studio | Games | Oceanspirit Dennis: Pirates on the Poopdeck! Download Oceanspirit Dennis: Pirates on the Poopdeck! This short, turn-based naval combat game was my first foray into the OSD universe. I hope you enjoy it! 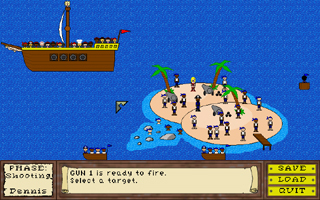 "A turn-based pirate arcade game made for the Oceanspirit Dennis series of games. This game is actually entertaining and worthwhile to play for those who aren't even into the joking nature of the OSD universe." I'm not familiar with this OSD universe but it's a cute little strategy game. I first thought it was impossible to win but after a couple of games, I finally won. I was surprised to find such an interesting strategical challenge from an OSD game. Amusing lines, piratey action, I reccomend this! This is an amazing naval strategy game. Well balanced, fun and funny, it is a worthy non-adventure title for even those who are not fans of the OSD storyline to enjoy.